Uz. Dr., Sağlık Bilimleri Üniversitesi, Bağcılar Eğitim ve Araştırma Hastanesi, Göz Kliniği, İstanbul, Türkiye Purpose: To compare the effi cacy of intravitreal anti-vascular endothelial growth factor (VEGF) agents for the treatment of macular edema (ME) following branch retinal vein occlusion (BRVO). 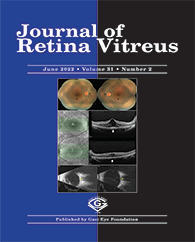 Materials and Methods: Totally 69 eyes of 69 patients with macular edema secondary to non-ischemic BRVO were retrospectively reviewed. Totals of 27 patients treated with intravitreal bevacizumab (IVB), 22 with intravitreal ranibizumab (IVR), and 20 with intravitreal afl ibercept (IVA) were included in the study. Best corrected visual acuity (BCVA), central macular thickness (CMT) and intraocular pressure (IOP) measurements were reviewed at 1st, 3rd, 6th, 9th and 12th months after treatment. Results: BCVA was significantly better in IVR and IVA groups, compared with the IVB group in 6th month (p=0.002). Similarly, CMT was significantly lower in IVR and IVA groups, at 6th month (p=0.001). Regarding 12th month results of BCVA, CMT and IOP values, there was not any statistically signifi cant difference between groups (p=0.72, p=0.34, p=0.40, respectively). The mean injection number was signifi cantly higher in IVB group and lower in IVA group (4.70±1.10, 3.40±0.50, p=0.001, respectively).